Levels of property security abroad will differ depending upon location. In some communities it is typical to leave home without so much as locking the door while in others it is normal for patrols of armed guards to circle the community. Yet others, a home may typically be safe until it is known that a foreigner lives in it. Whether you are concerned for your personal safety or the safety of your possessions, investigating common property security practices in your desired overseas community should give you some options. Working locks, security alarms, gates and fences and security guards are all common options for improving property security abroad. Whether you are in your home country or living overseas, working locks on your windows and doors is a security basic. In fact, in some areas it may not be considered breaking and entering or a forcible entry is someone enters a home via an unlocked door or window. 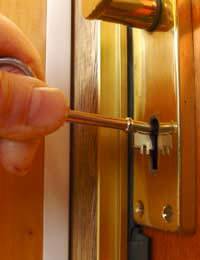 Even if locks do close, you may consider adding more if they look flimsy or breakable. At the very least a deadbolt lock on the door should be considered for a little added security. Installing a chain lock that allows you to open a door slightly is also a good idea for those interested in protecting their personal security from intruders. Security alarms are available in many areas of the world, however they do depend upon a number of factors. First, security alarms work best if the passwords for them are kept secret. Second, security alarms can only work if they are armed when you leave the house or retire for the night. Third, security alarms can only work as long as they have batteries or an electricity supply. While even the presence of a security alarm may give you a discount on your home or contents insurance it can only truly help to ensure your safety if it is used properly. Gates and fences are common types of property security in many areas abroad. These items may be electrical and high-tech, but again this means that they will only work so long as the passwords are kept secret and there is a good, working supply of electricity. More basic options also exist, some even so crude as to have crush glass on the top to deter others from trying to climb over. Barbed wire might also be an option if it is believed that maximum security is needed. Generally if such designs are needed there will be a precedent for them in the community and many other homes will be protected in this manner. Security guards are more common in some overseas areas than others. These may be armed guards and/or guards with dogs to patrol entire complexes, guards who watch gates and entrances to regulate the entry and exit of visitors or guards who live with a family and protect their own house or apartment. Again, if security guards are typical then many other homes in a community will be protected in this manner. Asking around and enquiring about best practices concerning security guards is the best way to learn about typical situations for property security abroad. Property security abroad will vary depending on the location of a home. Working locks, security alarms, gates and fences and security guards are all common methods of protecting property abroad.